We are now entering the zone of the first great Seasonal Festival of 2019 – The Spring Equinox, celebrated on March 20 this year, when the Sun leaves watery Pisces and enters the sign of Aries the Ram. The equinoxes are the twice yearly days when day and night are approximately equal in duration, symbolic of the balance between male and female energies in nature. Wisdom teachings of both Eastern and Western traditions celebrate this auspicious festival. As we shall discover, the roots of this celebration extend deep into humanity's history, originating in practices that predate written records. In the West, the Spring Equinox has a special significance for astrologers and spiritual practitioners alike. Western astrology is a system based upon observation of the passage of the Sun across the circle of the starry Zodiac from season to season throughout the year. There are four pivotal days each year marking the beginning of the four seasons, all related to the movement of the Sun as observed from Earth, the spring and fall equinoxes and the summer and winter solstices. On or around March 20 each year, the Sun appears to an observer on Earth to cross the Equator, night and day are approximately equal in length, and the season of Spring begins in the Northern Hemisphere. Archangel Raphael presides over the season of Spring. Raphael orchestrates the work of the elementals, devas and assorted nature spirits who help to vitalize and optimize the energetic and material structures of Earth's vegetation, from seed to fruition. Raphael is the great Angelic healer, who imparted to humanity the wisdom of healing herbs and flowers. Raphael is depicted with a caduceus in his hand to signify his role as healer. 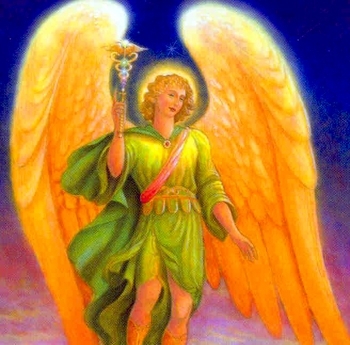 To participate in a beautiful healing meditation invoking Archangel Raphael, see our article Spring Equinox: The Archangel Raphael Meditation. The Spring Equinox being a time of equal day and night, Wisdom Teachings of the East and West perceive this pivotal moment in the yearly seasonal round as striking a cosmic balance between the feminine and masculine forces of yin and yang, shiva and shakti, fire and water. Western astrologers consider the Equinox to be the astrological New Year, a time of new beginnings. This is the day to honor the Norse Goddess Frigga, Queen of Valhalla, whose chariot was drawn by two rams. For millennia the Spring Equinox has been celebrated around the world as a festival of Resurrection, and it marks the start of the astrological New Year. For the temple priests of the Egyptian dynasties, Osiris, the dying and reborn god connected with the morning star Venus, was known as “the heart of the renewed sun”. Osiris was Lord of the Underworld and King of the Dead, but in his role as the resurrected God, Osiris represented light, life and consciousness, the ever-renewing power of the Solar Disc. Osiris was also the god of vegetation, often depicted with green skin. Egyptians created wood-framed barley seedbeds in the shape of the god, known as “Osiris gardens”. These sacred seedbeds have been found in tombs. Clearly, the plants which sprouted from these beds symbolized the resurrection of life after death. The soul of Osiris was said to rest in his sarcophagus during the winter season, and the spring equinox marked his resurrection. Osiris represented the eternal soul that incarnates into the physical world, dies, and yet is reborn into spiritual realms, only to reincarnate again and again in a cycle of transmigration transcending the lifespan of mere empires. All great spiritual traditions that have left written records behind, from the Sumerian, to the Egyptian to the Greek, tell the story of seasonal cycles of birth, growth, decay, death and rebirth, corresponding to the spiritual cycles of the immortal gods and of the immortal souls of men and women living on planet Earth. In the Neolithic age, prior to any written records, ancient scientists and priests, shamans and priestesses searched the night sky to find “fixed” reference points in the dance of the stars. This map would provide a structure reflecting the harmony of the universe, and provide an understanding of the orderly procession of seasonal change, rain and sun, that governed the yearly agricultural cycles upon which Neolithic communities depended for survival. This was the origin of both astronomy and astrology, magical and scientific studies that were simultaneously a source of agricultural guidance, divinatory and ritual powers. The knowledge of the Equinoxes attributed by many scholars to pre-literate Neolithic societies, and evidenced by structures such as Stonehenge, rests upon very careful, long-term study of the heavens and a sophisticated understanding of the Earth’s shape and movements throughout the year. The Earth wobbles in its orbit around the Sun. This is the source of our seasonal cycles. The North Pole of the Earth leans toward the Sun for half a yearly orbit, then leans away from the Sun for the rest of our Earthly year. Twice a year, on the Vernal Equinox and the Autumnal Equinox, the Earth offers half its face to the Sun, and day and night are of equal length. After the Vernal Equinox, the North Pole swings toward the Sun, which appears to be climbing higher in the sky day by day to observers in the Northern Hemisphere, as the season of summer progresses. In the Southern Hemisphere, the Vernal Equinox signals the onset of autumn, as the South Pole swings away from the sun, and the sun appears lower and lower in the sky, day by day. Clearly cultures of the North named the Spring and Autumn Equinoxes. In mid-summer, the North Pole’s tilt reaches its maximum point, and for observers in the Northern Hemisphere, the sun has climbed to its highest point in the sky. This is the moment of solstice, which means “sun-stop” in Latin. From this point on, the sun will appear lower and lower in the sky, day by day, to Northern Hemisphere observers. The Autumnal Equinox, the onset of winter, and the winter solstice follow in sequence, as the North Pole tilts increasingly away from the sun. What is the Precession of the Equinoxes? The fact that the Earth wobbles on its axis as it spins through space also creates the conditions giving rise to the much grander cycle of the Great Cosmic Year, a cycle intimately related to observations made on the Vernal and Autumnal Equinox by ancient astronomers. The ancient understanding of the cycles of the Great Cosmic Year, reflected in the calendars, mythologies and mathematics of Mesopotamia, India, Egypt, and Greece were all founded in a seminal conceptual breakthrough – the knowledge of the Precession of the Equinoxes. In simple terms, it’s another aspect of the Earth’s wobbling motion in its orbit around the Sun. The combined gravitational effects of the sun, the moon, and the planets on Earth’s equatorial bulge trigger a slow clockwise swaying motion of the Earth’s axis. Picture a spinning top and you’ll get the idea. It takes about 25,800 years for the Earth’s axis to complete one wobble, sway or circle of rotation. The sun’s apparent path around the Zodiac as viewed from Earth, called the plane of the ecliptic, crosses the equator each year on the day of the Vernal Equinox. At the exact location where the sun’s plane crosses the equator, the sun is directly overhead, and no shadows are cast. In this context, it is perhaps interesting to note that as a result of the angle of the sides of the Great Pyramid versus its latitude, it casts no shadow at noon on the day of the Spring Equinox. The ancients perceived the Earth as the center of the Universe, and took the Sun as their obvious fixed reference point. The astrological New Year began on the first day of spring, the Vernal Equinox, and many of their festivals, designed to invoke beneficial forces that would sustain the universal order and life in their communities, took place at that time. Naturally, they looked East at dawn on the day of the spring equinox to find which star constellation would “rise with the Sun”. This might give them insight into conditions that would pertain during the upcoming year. What a shock to discover over time that the constellation visible just before dawn was actually moving away, and another constellation was coming into view, very slowly. This process of “moving” from one sign to the next took more than two thousand years. Multiplying the length of time this took by the 12 signs of the Zodiac, they could calculate the exact length of the Cosmic Year, some 25,800 years. Some scholars say that knowledge of the precessional wobble and the changing Zodiacal cycles of the Equinoxes predate writing and the civilizations whose written records constitute our recorded histories. “. . .Sometime in the Neolithic age astronomers became aware of the slippage of the equinoctial sunrise, which threw the invariance of the solar year awry and, in time, invalidated ritual devices, such as Stonehenge, which were based upon it,” says Dr. Thomas McEvilley in his ground-breaking book “The Shape of Ancient Thought”. The knowledge of the Earth’s wobble introduced an element of instability, unpredictability and disharmony into a universe that was seen as potentially deadly, intimidating, full of cosmic forces that threatened the ability of human communities to grow crops, plan irrigation cycles, and feed themselves. In these societies ritual sacrifices made on a regular basis were the guarantors of life’s continuity, and substantial efforts were expended to create predictability, regularity, and harmony in both the natural and social spheres. Some scholars propose that the discovery of this minor irregularity in the Earth’s rotation, this wobble, and the precession of the signs of the Zodiac, is the seed and source of all mythology, calendars, astronomy and astrology. These scholars say that many of the ancient rituals enacted in cultures around the world were designed to manage the irregular, unpredictable, subtly changing and extremely threatening seasonal, yearly and multi-yearly cycles unfolding on Earth, seemingly in synchronicity with the complex cosmic patterns revealed by knowledge of the precession of the Equinoxes. In fact, the Earth’s wobble, the seasonal cycles that result from that wobble, and the Cosmic Year unfolding as a further result, were all seen as evidence of fundamental flaws in creation that triggered disharmonious events such as droughts, floods, earthquakes, crop failures, social upheavals, diseases, and even the natural action of aging and the restrictions imposed by life in the material world, structured as it is by the limitations of space and time. It was a short step from this view of reality to the notion that humanity was living in a “fallen state”, that there had been a prior Golden Age characterized by a continuous growing season, long life, social harmony, preternatural clairvoyant abilities and spiritual grace. In short, humanity pictured a time without the wobble, a time of complete cosmic order, reflecting its desire for a timeless state of predictable, eternal bliss, immortal life in a material universe that would be completely orderly, perfectly harmonious, and unmarked by sudden disruptions, complexity and outbreaks of chaos. Then another short step would bring humanity to the notion that the current sorry state of affairs must be the result of either a flaw in the Divine Architect of the wobbly Universal creation, or a flaw in humanity itself which triggered the onset of imperfection, aging, disease, death, and intermittent disaster. According to some scholars, the primal mythic motif of the Separation of the Parents of the World, Father Sky and Mother Earth, relates the story of the discovery of the Precession of the Equinoxes, the beginning of measurable time, the moment of the descent from the timeless Golden Age of universal unity, harmony and constancy. In the Golden Age there was only one long season of endless growth, but now we have fallen into the present unhappy world situation of duality, conflict between the primal masculine and feminine principles, irregular seasonal cycles, and variable yearly weather patterns affecting river’s flows, rainfall, crops, animals and all human endeavors. Examples of such heroes include Marduk, the hero who sets out to put the heavens back into order in the Babylonian Creation Epic; Ram, the Hindu Hero and Avatar of the Hindu Creator God Vishnu, who presided over the destruction and re-creation of human society in the epic Ramayana; the Sumerian hero Gilgamesh, and the Greek Odysseus. Plato and the pre-Socratic Greek philosophers of the centuries just prior to the birth of Christ, at the cusp between the Age of Aries and the Age of Pisces, believed in reincarnation and the Cosmic Year, and their systems of astronomy and music reflect the ancient Mesopotamian and Neolithic sexagesimal mathematics and Near Eastern mythological motifs. Xenophanes and Plato anticipated partial apocalypse in their own societies’ near future, while the Stoics and Manu envisioned complete world destruction coming soon. These types of apocalyptic predictions are characteristic references to the shaking of the world framework during the epochal movement from one Equinoctial Age to the next. This view offers a firm foundation for the argument that the scientific and mathematical skills necessary to understand the phenomenon of the precession of the equinoxes predate all human writing, extending far back into Neolithic times, according to McEvilley, and that the mathematics involved has conditioned spiritual and mythological systems ever since. In a little over a month, it will be Easter, when Christians in the west will celebrate the mystery of the death and resurrection of Jesus Christ. Christ is the Christian Avatar, who incarnated into the world, died as a sacrifice for the original sin of Adam and Eve, and for the sins of all men, descended into the Underworld, conquered Death itself, was resurrected on Easter Sunday, and later ascended into Heaven. Clearly, the story of Christ’s triumphant resurrection echoes the early vegetation festivals of death and renewal celebrated at the Vernal Equinox, which existed for thousands of years before the birth of Christ in cultures both literate and pre-literate around the world. Eggs are dyed with all the colors of the rainbow to symbolize the imminent birth of new life, in the fields, and among the plants and animals. Christ’s resurrection signals the transmission of Divine Grace that can trigger the re-birth of the receptive human soul at a higher level of consciousness, in more complete harmony with the web of life and the cycles of Earthly and Cosmic Change, as a result of Christ’s sacrifice and conquest of Death itself, which paid in full man’s debt for humanity’s original sin. At this time in history, on the day of the Vernal Equinox, the sun appears to us to be located between Pisces and Aquarius at dawn on the first day of spring. This is the scientific explanation behind the expression “the dawning of the Age of Aquarius”. Today, at the Dawning of the Age of Aquarius, at the Spring Equinox of 2018, we are surrounded by apocalyptic events and here in America, we live in a country where roughly a third of the people believe in the imminent literal end of the world, as foretold in the Book of Revelations. Esoteric science, as developed in the mystery schools of the East and West and handed down through oral traditions and direct experience of spiritual worlds, indicates that the time has indeed come for a new world hero to emerge. In the Age of Aquarius, that world hero is no longer a solitary individual god, goddess or Avatar. The identity of that hero is represented by the image of the God and Goddess in rapt, loving embrace. The Divine Lovers represent not only the balance between men and women that will characterize the new Aquarian society, but also the balance between the male and female aspects of ourselves as well as the equality and participation of all men and women in the heroic project of rectifying humanity’s monumental disruption of environmental systems, traditional social structures, and spiritual and religious traditions. Jane & I wish that you and your loved ones may greet the dawning light of this astrological New Year with fearless joy, fierce love and a playful Trickster child-mind, and may the coming seasons of growth provide you with golden opportunities to reach your highest spiritual goals.